A Literary Odyssey: The "Day After" Readathon. I think I just might join you. I probably won't get much reading done on the 1st, but I'll just be hanging out with my kids at home on the 2nd. This is perfect because I have three library books that are 500+ pages each that have to be returned in about two weeks. I need to get cracking! I don't have any weekend plans other than starting on preparing a nursery! (I told myself I had to wait until after the holidays he he.) I'll have to see how much reading I can fit in, but hubs and son will be home, so it may not be a ton. Totally joining in! Just found your blog too! This will be my first readathon ever :) I have some Dickens to get through. I might join in...I'm on a blogging break this week, but I'm definitely still reading! 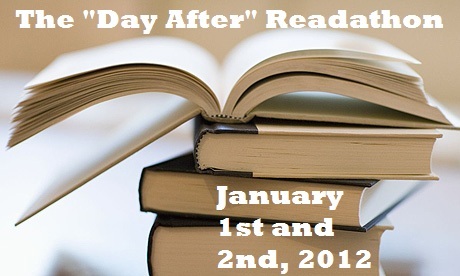 I will join you this time since I have some exciting reading challenges for 2012 and I can't wait to get started. This looks like fun! I will probably "unofficially" join in. I'll be with family and sometimes it is hard to know whether I should plan on doing nothing or if there will be a lot going on, but I am hoping to do a lot of reading on those days. I'm in as well. :) Due to the weather, I'm staying in this weekend anyway so I may as well read. I'm in! What a great way to start the new year! I'll join the "unofficials" as I try to read as much as I can these two days (today & tomorrow)! Today my goal is to finish Touch by Alexi Zentner - a lovely, lovely book.